Stand in front of the aerobic steps while holding a pair of dumbbells in each hand. 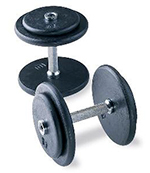 Step up on to the aerobic steps and curl the dumbbells up to your shoulders at the same time. Step down and lower the dumbbells back down to the starting position.